which the subject appears in its greatest simplicity. 'Ion cyclotron resonance occurs when ions move in a steady magnetic field such as that of the Earth. The field deflects them sideways and they go into orbit around its lines of force at a characteristic 'resonant' frequency which depends on the charge/mass ratio of the ion and the strength of the steady field. Exposing them to an oscillating electric or magnetic field at their resonant frequency lets them absorb its energy and they gradually increase the size of their orbits and their energy of motion. The resonant frequency for potassium in the Earth's magnetic field is close to 16 Hz.' (Goldsworthy, 2007). Such findings - new to Dr Male, but long known in bioelectromagnetics - of course beg the question and a variety of researches, most significantly including those of AR Liboff, have been directed towards identifying the source of such resonance, mostly associated with either a variety of molecules that might be capable within themselves of producing cyclotron resonance or with various membrane and calcium cascade effects. No works have been identified to date which deal with the possibility of it being the genetic material, the chromosomes themselves, as a possible source. In essence the principle of the machine is to fire accelerated and, therefore, high-energy particles at a trapped atom and then use the gathered energetic output data of the 'collisions', 'kicks' or 'perturbations' to better understand the particle/atom interaction in the given conditions. Using this cartoon as some sort of analogue, we have to ask if any such thing can be found in the genome? In order to explore this we first have to refer to the biological data. Whilst not wishing to oversimplify the case, there is a need for clarity that is best served by simple illustration. We start at the level of gross morphology in terms of the chromosomal material as this is the level at which the gedanken model is worked - and, of course, one level at which the system itself must work. The detailed structure of DNA will be dealt with as the need arises. The drawing above offers crude outline for the basic structure of the chromosome, at least as far as need be understood for the model. 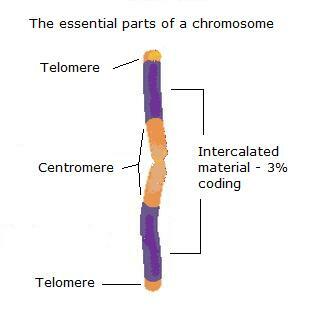 The essential structures are the two telomeres and the centromere, the material that is then intercalated between these being more variable and, as we now know thanks to the human genome mapping project, predominantly non-coding, with regions realising biological functionality then intercalated within that. This material arrangement constitutes the chromosome arm. 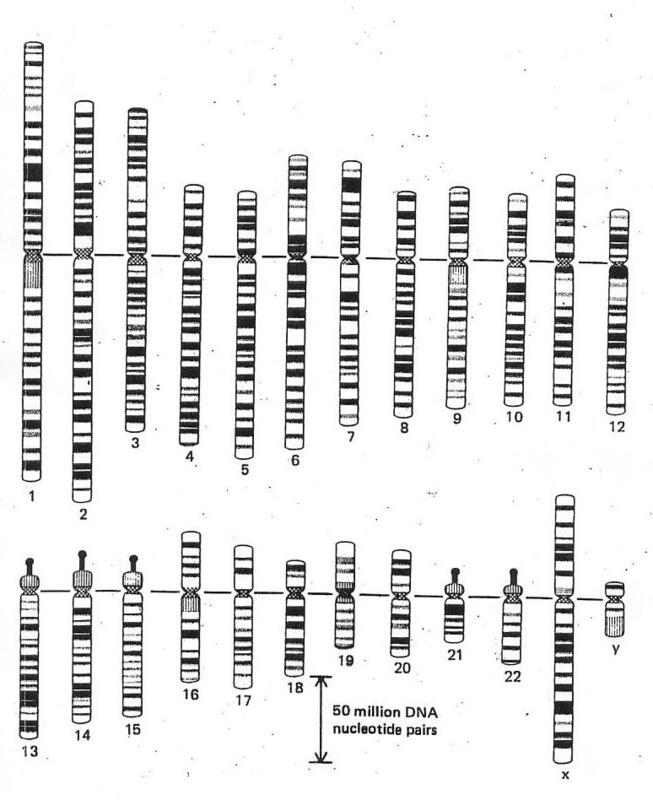 The illustration is an adaptation from web material for teaching and in this original, 'textbook' description the orange coloured material is termed 'heterochromatin', 'where the DNA is more condensed and usually there is not much transcriptional activity', i.e., was classically regarded as 'junk DNA', 'some of which material remains condensed throughout the cell cycle'. The purple material or 'euchromatin' marks 'where the "active" genes are generally found and usually this region is much less condensed'. It is, of course, grossly exaggerated here. Some 97% of any arm is pretty much really 'junk DNA' and should therefore mostly be orange with a few - approximately 25,000 - very thin purple lines scattered about. So 'classical' texts now need that update. There is a third required component within this material array that in fact underpins DNA function and duplication and that is the means of access to the bases and their sequence within the DNA helix for either mRNA production or DNA replication. Either of these functions is a transient state within the larger dynamics of the nucleus and the cell and we will return to them later. 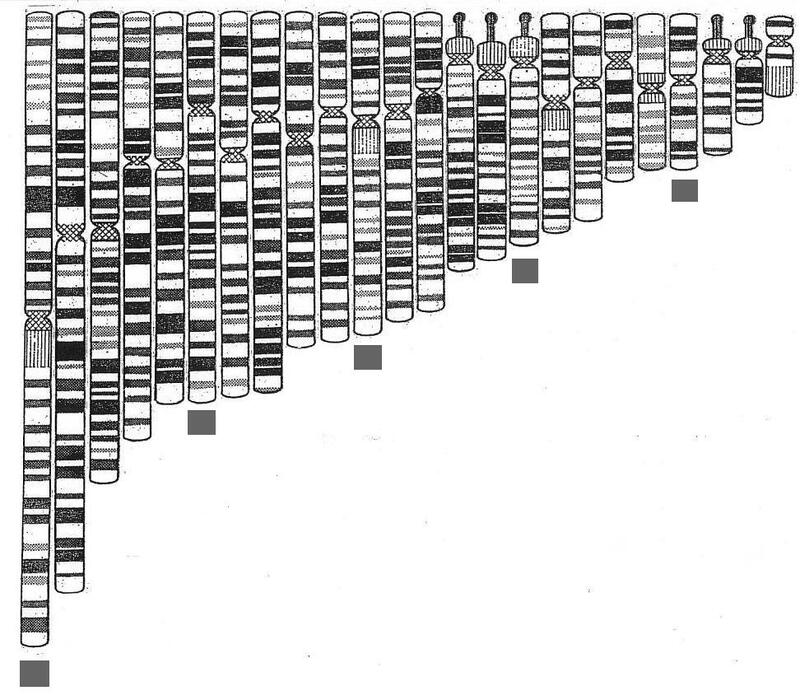 The gedanken experiment model that is to be developed here is a deconstruction based on this graphic presentation of the human genome taken from Alberts et al., The Molecular Biology of the Cell (2nd ed. and others). Derived from the earlier work of Ute Franke et al., it is a 'blocking-up' of the original, fine-scale data. - why is it laid out like this? Whatever the 'scientific' reason offered, this ordering obscures any 'natural', simple, pattern that recognises it as a system accreting crystalline mass over time. If we were to start with a simple bacterial genome of 1m base pairs, then the human genome, with 3,000m base pairs, can be simply understood as such an accretion system. It is only logical, therefore, to lay the set out simply by crystal length. - why does the system spin down to 23 pairs of chromosomes? This second question has to do with where QLS naturally has to start which is to ask the seemingly ludicrous question of 'How many types of atom are involved in living systems working? ', i.e., what are we looking at in terms of componental complexity? We could trawl all the books and average our results or, instead, just take any reference to act as initiator for the model and this latter is the path taken here where one of the early texts in 'bioinorganic chemistry' (a developing discipline through the late 80s) from Frausto da Silva & Williams (1991) declares interest to be focussed around some 25 elements significantly involved in cellular organisation. This list of 25 elements does not, of course, include Carbon which has its own extraordinary organic chemistry. This then suggests a model using 26 system elements. Life has trite, humorous or minimal description as being a 'carbon-based system dependent on water' - hydrogen and oxygen - which then gives a founding set of 3 elements as the 'system itself', if you like, leaving 23 elements needing ordination and control in the complex environment of the cell. This 1:1 mapping of 23 free elements and 23 chromosome pairs is very suggestive in terms of information theory, at least, but we know that it is not, could never be - indeed imagine how much more complex evolutionary study would be if it were the case - that an organism could embed in a single chromosome its total potassium functionality, for instance, but we know that it is there, necessarily, somewhere, as a network distributed across the set. Two further points need be made here, the first having to do with the nature of the model as an abstraction of a graphic presentation. The original itself of course has some level of error and the blocking-up of Alberts et al., introduces further error of course. The model made here then offers a third level of error. We then need to ask whether the results that seem to spin out quite naturally are 'artifact' or indicative of a robust system? How many errors can you make before you end up at the truth anyway? There is a need to look at the inverse of Grover's quantum theory-based search algorithm for unsorted databases to determine, instead of the shortest route to the desired end, the maximum route that might be taken before the desired end is reached anyway. What happens also then when new steps are introduced to the route? The other point of significance that needs to be made is that the fundamental components that are the system itself, i.e., carbon and water, are both functionally tetrahedral and, therefore, fractally 'conformal' or 'congruent'. These founding three also have symmetric oxidation states - Carbon 8, Oxygen 4 and Hydrogen 2. The only other significant atomic species with symmetric oxidation states is Sodium with 2. The classical layout of the genome as given above seems to have no natural logic beyond the science of the day and so we are free to explore any more rational construction. Laying the set out by size seems a first and most reasonable step. * The five condensed arms can be taken to indicate that we have 5 sub-systems operating in parallel. This possibility is confirmed when we make up the implied 5 sub-sets by the simplest logical means within the ordering by size of the group. If we take the five longest chromosomes of the set as the longest of each of 5 sub-sets and then recruit subsequent set members by fives, it can be seen that each of the sub-sets generated will in itself constitute an harmonic set - see figure above. That such a simple logic is valid seems confirmed by the fact that it does result in the 5 highly condensed arm chromosomes self assorting so that each is in a different sub-set - see figure below. Further, there is also circumstantial evidence for this 'five-foldedness' of the system in the fact that the average number of signal protein binding sites in the upstream or downstream promoter regions of genes is five - which makes sense in terms of information sharing in five parallel processing systems - each sub-system would inform itself and the four other systems, each then having five-fold input and ensuring the synchrony of working across the sub-sets. * The second point of note is that simply by the structure of these five chromosomes we might fairly propose that the single or individual arms in fact form the basic units of the fundamental set. As has earlier been shown the double structure chromosome set, i.e., the normal two armed structure, offers only a rather crude and lumpen harmonic pattern to emerge while the single arm array, generated by separating the arms at the chromosome waist (above) makes clearer the harmonic arrangement of the DNA crystals when in this condensed state characteristic of the cellular metaphase. 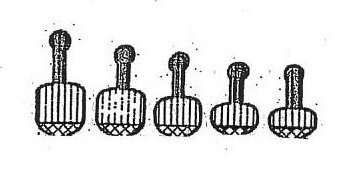 The five more highly condensed rRNA arms are also harmonically arranged, as illustrated below. Just this first step of reconstruction brings to the fore the significance of the five 'condensed arm' or 'half-chromosomes' that seem to indicate five sub-sets operating in parallel and it is these structures that immediately also identify themselves as possible analogues for our cartoon cyclotron. The above illustrates the general structural parallel, but we need to take this cartoon analogue piece by piece to check out how far this extends.